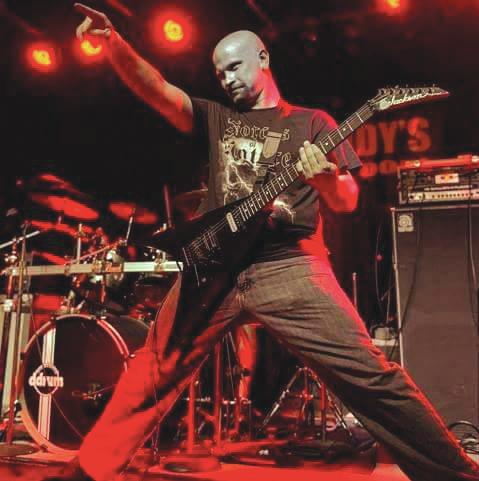 Metal guitarist and Wilmington resident Chris Elliot of the band Omeni. COLUMBUS — When iconic heavy metal singer Rob Halford of Judas Priest took the stage last Monday night and performed with new wave Japanese heavy metal band Babymetal, many fans in the tradition-soaked genre were surprised. But Bowling Green State University anthropologist and pop culture professor Dr. Jeremy Wallach said the collaboration didn’t surprise him at all. Heavy metal music isn’t just growing in popularity in the U.S., it is growing in worldwide appeal, he says. And with that international growth comes a shift in what defines heavy metal music. The historic pairing of “old and new” music didn’t surprise Xenia native Chris Elliot of Wilmington or music blogger Jonathan Williams of Washington Court House, either. On the Alternative Press Music Awards show stage in Columbus last Monday, Halford and Babymetal lead singer Suzuka Nakamoto broke into the iconic Judas Priest songs “Painkiller” followed by “Breakin’ the Law.” The jaw-dropping 13-minute performance received a standing ovation in the packed Shottenstein Center. The pairing drove home both the growing appeal and growing international flavor of metal. In fact, “goregrind” metal musician Dylan Taylor Lehman of Yellow Springs says it is this very international growth of metal music that he finds most appealing. Babymetal began with its three members Nakamoto, 18, Moa Kikuchi, 17 and Yui Mizuno, 17, debuting their act in Japan five years ago. They have released two CDs with their second, “Metal Resistance” breaking into the Billboard top 40 after its release April 1. They made their U.S. TV debut on the Late Show With Stephen Colbert this spring. Wallach said there is something new and fresh about the new kids’ sound: Weird, but people like it, he pointed out. “Babymetal represents something about heavy metal that people like who don’t normally follow this music or don’t know that it is there. And there are people who wish it wasn’t there,” Wallach said, referring to the band of “Babymetal haters” among the metal music purists. “For Babymetal fans there is a willingness to have fun and embrace something that isn’t normal and the willingness to accept that everyone isn’t the same,” Wallach said. The band is just an example of the changes in the world of metal music, from Tokyo to Ohio. Elliot’s four-member band consists of himself on guitar, Tim Hasty from Dayton on vocals, Cole Bohanon of Centerville on bass, and Cory Hall of Xenia on drums. His band has been together about a year and a half. Their genre is more of a death metal, power metal band. They play almost every weekend across Ohio and other states, now opening for national metal bands such as Cannibal Corpse. “It is definitely a different ballgame being on the national stage,” Elliot said. Laura Miller of Columbus, is a member of a small but growing legion of women metal musicians. She is lead guitarist with the heavy metal band Fool’s Crown. She said she took her twin 15-year-old daughters to the APMA show last Monday and thought the entire show “was just great.” She added that her daughters also loved the performances as well. She doesn’t listen to a lot of international metal, but does appreciate the number of Japanese metal bands fronted by women such as Babymetal, Scandal and Band-Maids. She said she would like to see more women in metal bands such as All That Remains, Nightwish, Evanescence, In This Moment and Halestorm. Right now Miller said she is listening to bands The Descendants, Killswitch Engage and Dream Theater. Her band, which includes her husband Matt Miller on drums, Jim Swanson on bass and Christian Ellis on vocals, has been together for more than 13 years. “We’ve been described as a sort of thrash-punk metal band,” she said. During the red carpet walk before the APMA show started last Monday, a number of the performers and presenters were asked what acts they were looking forward to seeing that night. Most mentioned the Halford-Babymetal collaboration. Of Mice and Men bass player Aaron Pauley told Civitas Media that he wanted to see the performances by “Papa Roach, A Day to Remember and Babymetal.” The band’s lead singer Austin Carlisle, added that, “Babymetal’s new song (Karate) is the best song out there now.” He also said he was looking forward to seeing Papa Roach and Babymetal. “I was disappointed that I didn’t get a chance to see them (Babymetal) last year at Rock on the Range” said the singer. Alexis Saunders of Jackson, Michigan was one of them. He said there is also an increase in the number of people of color, both in the U.S. metal scene, because there are no more barriers to the music. Jonathan Williams of Washington Court House agrees with Wallach. “I think the rise of the internet and YouTube has played a big role in the growth of metal and its spread throughout the world. It is changing music, changing metal,” he said. Williams is a founder of the Facebook group called “33 1/3”, dedicated to discussing and sharing all types of music and genres, including metal. “My musical interests run from Benny Goodman to Louie Prima to Metallica,” he said. Williams said he likes all types of music, as long as it has a melody. “But not a group like (popular German metal band) Rammstein, I don’t hear any melody there,” he said. Jae Himes of Canal Winchester has had a front row seat for the explosion of heavy metal and hard rock in America. Himes said the first year of the show was just one day and a few bands. In 10 years it has grown to three stages with more than 60 bands over three days. In 2007, 35,000 attended. The last four years the event sold out with more than 120,000 attendees each year. “There has been a huge growth over the last 10 years,” Himes said. He added that there has been a lot of growth in the rock genres, and splinters within the genres, including international groups like Babymetal. “They were at Rock on the Range last year. Their brand of music is probably not a flavor for everyone. I would listen to them, and I can see people latching onto their music,” Himes said. Himes said he listens to a variety of metal and alternative music bands. “I listen to Disturbed, Five Finger Death Punch and new band Meytal. International bands he likes include Epica, a Dutch band, and Amaranthe, from Sweden. Both have female lead vocalists. Commercial success and growth of metal isn’t what interests Dylan Taylor Lehman of Yellow Springs. Lehman is a member of the Dayton-based metal band called Orchiopexy. He said that is how a lot of the major, legendary bands got their starts. “These were teenagers obsessively mixing tapes for each other. That is the reason I like this kind of music. It is community, self-contained on its own terms. There are labels releasing this goregrind metal, but I like existing outside of that – trading this music and sharing it for the sake of it. Completely underground,” he said. Has international metal had an impact on American metal music? “Oh sure. Distinct areas, countries and even cities will have distinct takes on metal that appeal to people. Grindgore …was started in Birmingham, England by a band called Napalm Death in the early 80s and caught on with fans around the world and spread from there,” Lehman said. In Colombia, he said bands there play a very specific type of death metal that is instantly recognizable as Colombian. Certain sounds can be the hallmark of that country, Lehman pointed out. Wallach is associate professor, department of popular culture at Bowling Green State University. He has written a number of articles on international metal music and two books: “Modern Noise, Fluid Genres: Popular Music in Indonesia, 1997-2001”; and “Metal Rules the Globe: Heavy Metal Music Around the World”, written with Harris M. Berger, and Paul D. Greene, eds. Duke University Press, 2011. Wallach says that today there are metal scenes, small ones, sprouting up in some unlikely places. “There is a large metal scene in Indonesia that rivals Japan. But there is also a metal scene in Nairobi, Batswana, and metal bands out of Saudi Arabia. In Indonesia, the prime minister is said to a huge metal fan. “There is a massive metal scene in Japan, of course. Japan is the world’s largest market for recorded music like CDs. They are perfectly content to produce music just for their national market. Their heavy metal music is directed at the Japanese. They don’t think Americans would be particularly interested in music they can’t understand,” Wallach said. They were wrong about the U.S. not being interested in music in a language they cannot understand, he said, pointing out the appeal of Babymetal. “I had predicted something like Babymetal happening for a long time.With the spread of heavy metal’s popularity in Asia, and the growth and availability of videos on YouTube, eventually something like this would become popular in the United States. I think there will be more and groups like Babymetal,” Wallach said. What is the international appeal of metal music? “That’s a good question. It may vary depending on where you look. It has something to do with the music’s cathartic energy. It has to do with the music’s intensity, complexity and difference from the mainstream. Most people would not think of metal as a mainstream, conformist, popular style of music that everyone is supposed to like. It is music that sets you apart,” Wallach said. He said metal is popular in Nepal, Finland and all of Latin America.It’s popular in Singapore, Malaysia, and despite the governmental situation there, there are state-sponsored metal bands in Cuba. “It is the only place in the world with state-sponsored metal bands,” he pointed out China has a very small metal scene, with bands in every province, but very few fans. What does the professor like? Like others interviewed about the growth of metal, Wallach was asked what he is listening to today and what bands he would recommend. “One band is the Taiwanese group Chthonic. They are the best metal band of the 21st century, I think. I just bought the new “Unlocking the Truth” CD which has some good tunes on it. Some young teenage kids from Brooklyn, with some great YouTube videos. There’s a band called Amorphous from Finland. They are very accomplished, creative and musically sophisticated,” he said. Has metal as an American music form received the credit it deserves for popularity and record sales? “In this sort of retraction and retrenchment in the music industry, (music executives) notice that people who are into metal still buy records. They are not as reviled and dismissed as they once were. Metalheads have a certain market value that they didn’t used to have. That said, heavy metal traditionally has not been a favorite of the critics,” Wallach said. Wallach said the most articulate defense of metal he has seen in the mass media has come from places like The Atlantic Monthly writer in a blog called Pop Matters, and written by people about his age. “When you reach your late 30s, suddenly you are not some little kid that everyone ignores like in the early 1980s when everyone was trashing metal. There was hysteria and anti-Satanist moral panic then. Our voices weren’t being heard then. There were no blogs or internet,” said Wallach. But metal still is not getting a lot of respect. Wallach says he has gone to many conferences where metal is viewed quite negatively, conferences of music scholars, music critics, and they look at it with disdain. But metal fans have buying power. “Metalheads read – they read a lot. They are a literate bunch. That means that metal books sell. Metal records sell. People say… ‘You still buy records? You still read books?’ I get sick of people saying that,” Wallach pointed out. Brock, Gary. "Heavy Metal Music Growing Everywhere." Wilmington News Journal. Accessed August 18, 2016. https://wnewsj.com/news/22959/heavy-metal-music-growing-everywhere.